Back in summer 2018, I attended Mando’s first graduate recruitment day, and after a day of group tasks and an informal interview, I was offered the job. My first job since graduating university. Being a recent graduate, I hadn’t yet had a chance to specialise in a particular area of software development. But at Mando I’ve had the opportunity to work closely with each department and gain invaluable exposure to the full development process. I learnt more in my first month at Mando than my entire time at university studying Computer Science! By my second month, I was already contributing to client-facing projects. I’ve had more real project work than I ever expected. 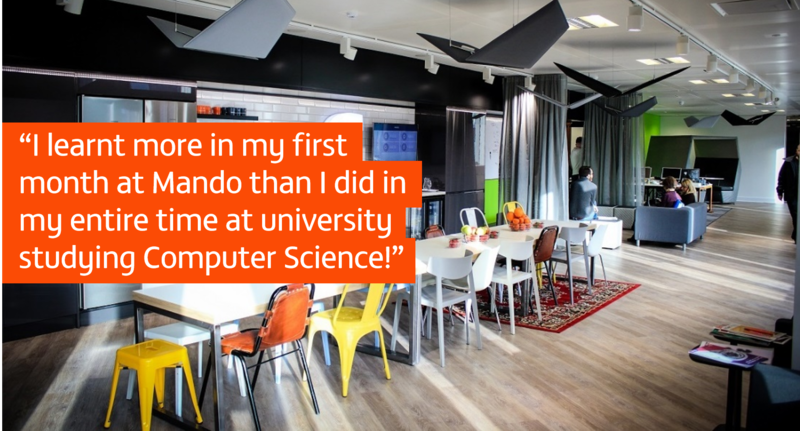 Mando’s software developer graduate scheme has now reopened, and they’re looking for graduates to join the business from summer 2019. 8:55: I usually get in to work at this time. As I live in Bebington, I’ll get the train to Liverpool. Mando’s office is very close to Moorfields station, so it’s incredibly convenient. One of the best things about working at Mando is the flexibility in working hours – if it fits my schedule, sometimes I’ll get in an hour earlier and then finish an hour earlier (or vice versa). I’ll grab a cup of coffee and start my PC. There’s free fruit in the kitchen for breakfast too! If it’s Friday, we do an office order for breakfast butties, which is always great. 9:00-10:00: Every day starts with a quick email check. As I’m currently situated on our managed services desk (where clients ask us to fix bugs, request alterations to their websites, and pose general queries), I’ll catch up on anything from the previous day – whilst our working day ends at 5:30, clients will often request help outside of these hours, so it’s important to keep an eye on everything. I’ll occasionally have an early meeting or Skype call with a client to discuss ongoing work. 10:00-12:00: After the initial admin and catchup period, I’ll likely have a few tasks to complete. In these two hours I tend to put my headphones on and concentrate on writing code. Most of the programming work at Mando involves C#. I didn’t have any experience with the language when I started the job but found it easy to pick up with the help of my fellow developers. Never be afraid to ask for help, as the development team is always keen to help a newbie. 12:00-13:00: Lunch! We’re lucky enough to be surrounded by a variety of restaurants and cafes, so there’s a huge amount of choice. There’s always a few people in the kitchen area with lunches from home – it’s always a very chatty and light atmosphere. I’ll do whatever I feel like on the day. Team lunches are also a great way to bond while eating some amazing food – we went to Mowgli (Indian street food) for our last development team lunch. 13:00-14:00: On Tuesdays, we’ll have our development team meetings here. These include a full round-up of our team’s activities – we’ll go around the table and each say what we’ve been working on. It’s always interesting to know each developer’s workflow. 14:00-16:30: Like the morning, I’ll try and focus on completing my tasks of the day. This will occasionally require help from our front-end developers, our project managers, or even just another member of the development team. Work here is always very collaborative, which can make things far less stressful than working alone. 16:00 on Fridays, the whole company gathers in the kitchen for a beer and weekly round-up, and to have a shot at ‘Seal or No Seal’. If the weather’s nice, we’ll head out to the roof terrace instead. 16:30-17:30: As the day is winding down, I’ll try and find time to work on my non-urgent backlog of activities. These include filling out timesheets, emailing clients, and reading training material. Given the nature of software development, it’s always helpful to learn as much about your technology of choice as possible. 17:30: Time to grab a beer with the team! 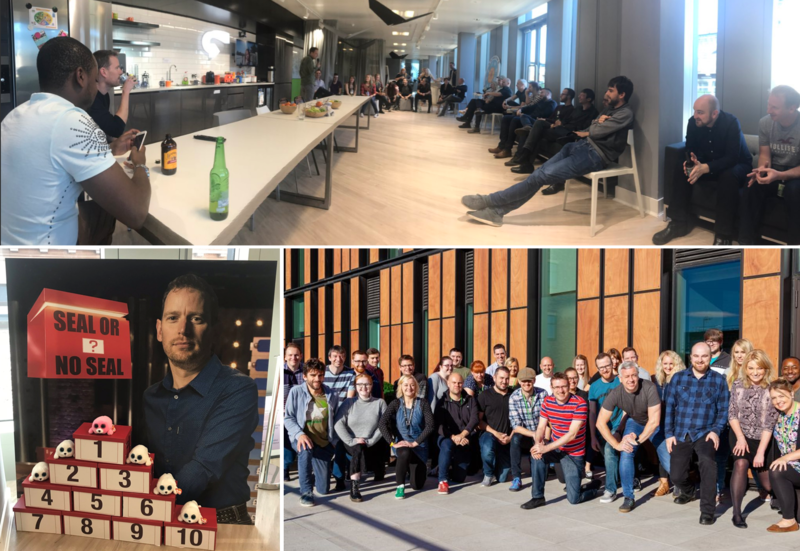 The past six months or so has been a massive learning curve, and really challenging at times, but I’ve had fantastic support from the rest of the team and I hope to continue learning in this role.